Creating great party nibbles is all about keep food fresh, colourful, nutritious, small and easy to handle. Cucumber slices (leave skin on) and pipe on top smoked salmon or eel pate. French bread with smoked salmon or eel with cantaloupe, thin lemon slice and brie. French bread with smoked chicken, brie and cranberry. French bread with pastrami, lite cream cheese, gherkin and tomato sliver. Rye bread and lite cream cheese with: smoked oysters and parsley sprig; prawn and cucumber; strawberries and kiwifruit; chilli mussels. Mini lamb mince balls with natural yoghurt, cucumber and mint dip. Filo triangles with spinach and mushroom filling. Fruit platter with yoghurt dip, e.g. grapes, cantaloupe, watermelon, banana (slice into diagonal pieces just before serving), kiwifruit, strawberries, stone fruit, cherries etc. Serve with toothpicks. Breadcase savouries filled with mushrooms; creamed corn; oysters; egg /cheese and tomato. 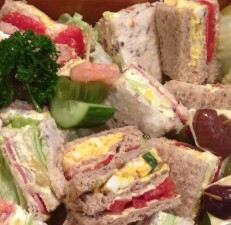 Mini club sandwiches: cottage cheese, crushed pineapple, mint and lettuce; egg, tomato and lettuce; pastrami, wholeseed mustard, cottage cheese and gherkin. Turkey, lite cream cheese and cranberry. Raw vegetables, e.g. mushrooms, celery, carrot and courgette sticks, broccoli flowerettes, red and green peppers, gherkins, olives, radish, cherry tomatoes – served with a simple tomato salsa dip or guacamole (avocado dip).